An investigation into the interplay between policy makers, planners and residents, which led to the Bijlmermeer's negative reputation and consequent renewal scheme. A couple of months ago Failed Architecture interviewed artist Yana Dimitrova about her work as an artist in residence in Amsterdam’s Bijlmermeer estate. In a recent contribution, Jan Loerakker and Lea Olsson investigated the several renewal schemes that were envisioned for the area. In this last article of our triptych, Tim Verlaan elaborates on the reasons and decisions which led to the Bijlmer’s failure in becoming a desirable place to live. Initially the modernistic Bijlmermeer was met with great enthusiasm by the popular as well as the professional press. However, from the mid-1970s onwards the estate received a bad press due to high vacancy and crime rates, and by the early-1980s the image of a problematic architectural monoculture had emerged. Built-up by the press as well as architects, planners and policy makers, this image strongly influenced the regeneration schemes discussed in Lea Olsson and Jan Loerakker’s recent contribution ‘Revisioning Amsterdam Bijlmermeer’. Rather than focusing on the regeneration schemes themselves, this article will closely examine the formation of the image of the Bijlmer estate as an unquestionable design failure. The popular press often discusses the history of the Bijlmer as a rectilinear path towards imminent failure, mainly determined by extreme flaws in the estate’s design. In this contribution however it will be shown that the emergence of the professional and policy makers’ negative views of the Bijlmer was a complicated and inconstant process. By investigating this process a new light will be shed on the regeneration schemes as discussed by Jan Loerakker and Lea Olsson. In June 1965 the final design for the Bijlmermeer, soon shortened to ‘Bijlmer’, was presented to the public. At that time, more than forty percent of Amsterdam’s housing stock was considered to be obsolete and outdated. By building the ultra-modern Bijlmer, the municipality wanted to simultaneously deal with issues of quality and quantity in the city’s housing market. Amsterdam could once again become the ‘mecca of urban planning and social housing’. The CIAM-inspired Bijlmermeer plan offered spacious 9 to 15-storey honey-comb flats in a green environment with central everyday amenities and a separate traffic system, which included a metro connection with Amsterdam’s inner city and cars on elevated levels, prohibiting the latter from interfering with pedestrians and cyclists. Ample provision of collective spaces and recreational facilities was meant to stimulate a sense of community. In sum, 900 hectares of farmland was to be turned into a residential area with 35.900 dwellings, which equalled 110.000 inhabitants. National media outlets and architecture and planning journals wholeheartedly embraced the plan. This positive reception, and the bravado by which the municipality presented the plan, concealed the fact that previously heated debates had taken place behind closed doors. The Bijlmer’s housing stock would consist of 95 per cent high-rises, which according to some planners working at Amsterdam’s planning department could result in monotonousness. After visiting Stockholm’s modernist expansion areas in the early 1960s, the head of the planning department Jakoba Mulder said she feared a dormitory satellite city with alienating tower blocks. She pleaded for a considerable reduction in high-rises, making the Bijlmer more similar to the more moderate General Expansion Plan (envisioned in 1934) to the west of Amsterdam. Despite this, the municipal executive backed up the planners in favour of the radical high-rise scheme, most likely because of the pride they took in opting for futuristic instead of modest planning. Ultimately the plan was carried through. A minority of young architects not working for the planning department shared Mulder’s criticism. Aldo van Eyck, Constant Nieuwenhuys and Anton Alberts were particularly critical of the ‘inhuman’ scale, even calling elements of the plan ‘frightening’ and ‘frustrating’. Moreover, the first residents would soon express grievances over structural deficiencies in the overall planning scheme. In order to comprehend the negative image of the Bijlmer that came to the fore during the 1970s, it is necessary to briefly discuss the estate’s shortcomings. Bijlmer under construction in 1970. As Lea Olsson and Jan Loerakker already pointed out, the expected rush on the flats did not occur; vacancy rates rose quickly during the early 1970s. 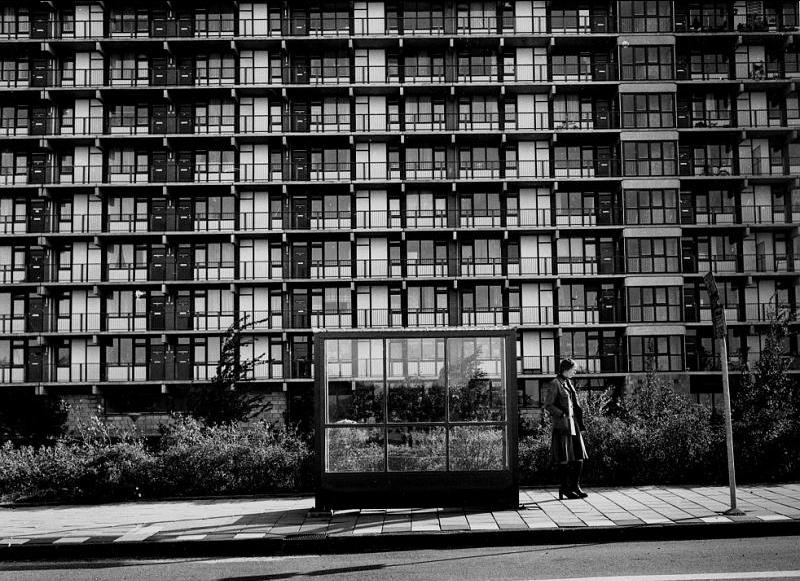 In 1974 alone 30 percent of families living in the Bijlmer moved out. An important reason for this was the high rents and equally expensive fixed costs, which were at least five times as high as in Amsterdam’s nineteenth-century districts. Also, residents filed complaints about structural failures and everyday nuisances in their living environment, such as the planned but not yet realized central amenities, poor accessibility of the flats, leakage and malfunctioning elevators. The design quality of the estate simply did not match the costs of living. Migrants and people from the Dutch Antilles and Surinam soon replaced the mostly white middle-class families. The already high and ever-rising rents could not be paid for by these economically weak population groups, leading to rent arrears and a continuous neglect of the estate by the local housing corporation. The issue of high rents was soon dealt with by offering generous rent subsidies, but instead of attracting people who actually wanted to live in the Bijlmer the area was soon populated by people who had no other choice. However, the main reasons for the estate’s popularity drop in the early 1970s were the pace at which planners developed housing alternatives and the way in which the living preferences of a younger generation changed. From the late 1960s onwards this young generation started to discover the merits of inner city life and qualities of a densely built-up urban environment. Much to the demise of Amsterdam’s municipal planners, the once-derided nineteenth-century districts were revalued, subsequently setting in motion their ongoing gentrification. Simultaneously, low-rise suburban nuclei were luring young families and the elderly. In the early 1970s, Dutch planners started to develop suburban housing alternatives in growth nuclei near large cities on a massive scale, a paradigm change in planning policy instigated by the national government. Soon after their completion, the Bijlmer flats had to compete with a rediscovered inner city and semi-detached houses in the rapidly developing growth nuclei surrounding Amsterdam. 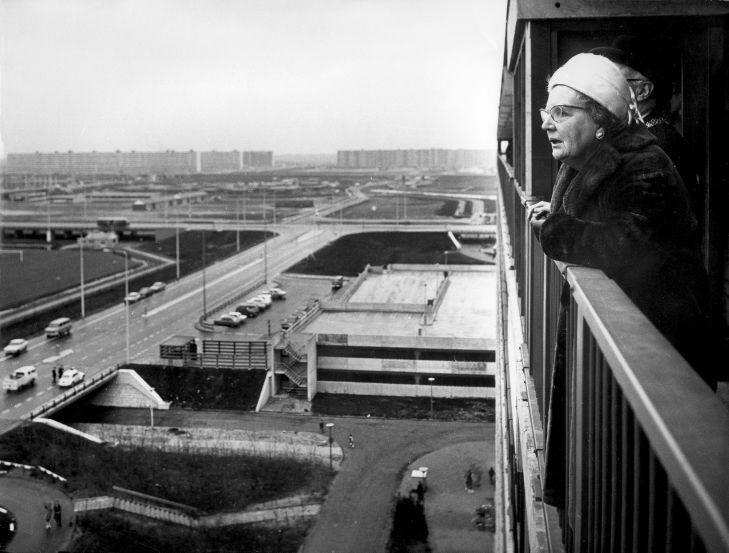 Queen Juliana of the Netherlands overlooking the Bijlmer from a recently completed flat in 1971. From ugly duckling to unused potential? 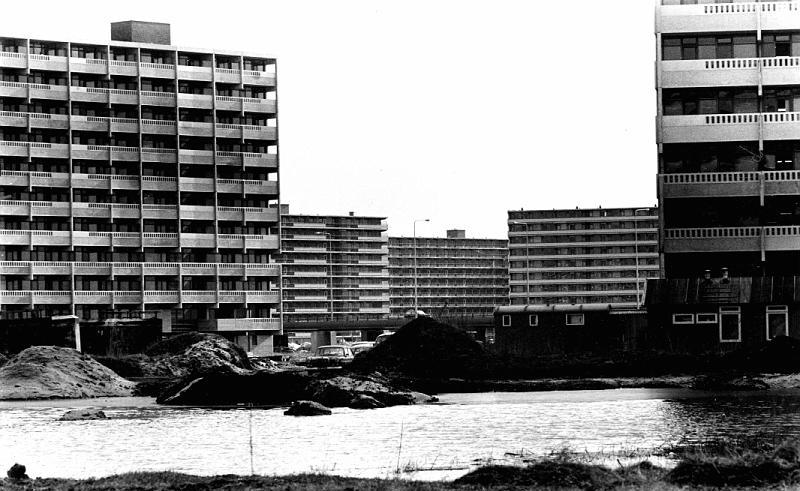 The aforementioned state of affairs gave the Bijlmer an extremely negative reputation from the mid-1970s onwards. It seems that during the late 1970s bad press overtook reality. The media almost solely concentrated on drawbacks and failures. Most Bijlmer residents agreed upon one thing: their estate had been ‘crushed to smithereens by the written press, filmmakers and opinion makers’. In a 1980-brochure, residents stated they were fed up with the ‘misleading’ image of the Bijlmer as a ‘culmination of misery, crime, vandalism and decay’, notwithstanding the ‘very serious problems’ the estate encountered. The negative reputation was increasingly disputed by a group of tenants that came to be known as the ‘Bijlmer believers’, who are estimated to have made up one-quarter of the estate’s population. These people merely blamed budget cuts at the construction stage for the later deterioration, and they demanded decisive action. In 1983 the Amsterdam Council for Urban Planning confirmed that slanted media coverage was one of the main reasons why people kept moving out and others were deterred to move in. In the same year, a rescue operation was set up by the national government, municipality and the local housing corporation. Demolition was still out of the question; rather policy makers aimed at intensive social engineering and monitoring whilst simultaneously improving the built environment, thereby tackling issues of vacancy, bad living conditions and the lack of central amenities. Public spaces were reorganized and several dwellings were split in order to diversify the housing stock and social composition of the estate. Also, several low-rise complexes were developed in order to urbanize and condense parts of the Bijlmer, but these neighborhoods quickly turned into problem cases as well. The vacancy rates were eventually forced back, but in 1987 it was concluded that the concerted efforts had not diminished turnover rates, and that unpaid rents had remained at an unacceptable level. Remarkably, government officials mainly blamed social problems for the deterioration of the estate, whereas the Bijlmer believers blamed the deficiencies in the built environment. At the same time, architects and planners still voiced appreciative as well as unfavorable opinions. It is therefore not fair to say biased journalists and professionals have merely ruined the estate by writing and talking about it in a negative way. More often than not, residents shared their criticism, albeit without the sensationalism that often accompanied the articles. This might be proven by a series of resident enquiries conducted from 1990 onwards. In this year, 77 percent of the people interviewed stated that crime was the estate’s main problem, without directly linking this to its urban design. This correlated with statements made by the core group of Bijlmer believers. Only 21 percent of the interviewees thought it was necessary to change the urban structure, but the enquiry however also pointed out 46 percent of the residents thought (partial) demolition would be a good idea. The enquiries demonstrate just how inconsistent and contradictory the planning trajectory towards the Bijlmer’s regeneration scheme was. During the late 1980s the means and ends of revitalization were further examined by a taskforce made up of representatives from the municipality, housing corporations and the local business community. Contrary to earlier reports and resident opinions, the taskforce concluded that only one solution could solve the Bijlmer’s problems: wholesale urban renewal. One quarter of the high-rises had to be demolished and replaced by ‘more popular’ housing types, one quarter had to be sold and upgraded for tenants with higher incomes and the remaining housing stock was to be refurbished for people with modest incomes. For the first time, policymakers directly and unequivocally linked the estate’s social problems to its urban design. An enhancement of the existing dwellings – which were after all extraordinarily spacious – was not really an option since the state would only subsidize the renovation of pre-1968 developments. This radical break in policy stemmed from despair over the failure of the previous social measures combined with a lack of financial means on the side of the housing corporation. The feeling that something radical had to be done to address the Bijlmer’s issues, not least its negative image, became widespread during the late 1980s. Renewal of the Bijlmer in the 1990s in full swing. Since 1992, the number of high-rises in the Bijlmer has been reduced from 95 to 45 percent of the total building stock, with most tenants being provided with affordable substitute dwellings within the renewal area. The latter mainly consist of single-family dwellings with gardens, which had already come to dominate the suburban landscapes of growth nuclei such as Almere from the early-1970s onwards. The local housing corporation saw this typology as the solution to the Bijlmer’s problems of vacancy, high turnover and expensive management. In addition to the renewal of the housing stock, an entertainment area comprising of a football stadium, several concert halls, a multiplex cinema and several chain stores was developed in order to give the Bijlmer a more urbane and alluring character. An important stimulus for the sudden vigor by which the estate was to be physically renewed was the establishment of the Bijlmermeer as an independent urban district in 1987, with its own locally elected councillors. The Amsterdam municipality would no longer determine who came to live in the Bijlmer; the district now needed to attract new population groups on its own. Obviously, the district’s administrators and housing corporation officials thought that by wholesale urban renewal the persistent negative image could change for the better. Local policy makers eagerly used and abused the Bijlmer’s reputation and even reinforced it, which might be demonstrated by an European subsidy application entitled No ghetto: The urban renewal of the Bijlmermeer. Remarkably, the renewal scheme quickly got the support from the majority of the Bijlmer residents. Whereas in 1990 almost half of them thought partial demolition would be a good idea, surveys from 1995, 1999 and 2001 show that the number of proponents had risen to an average between 65 and 70 percent. 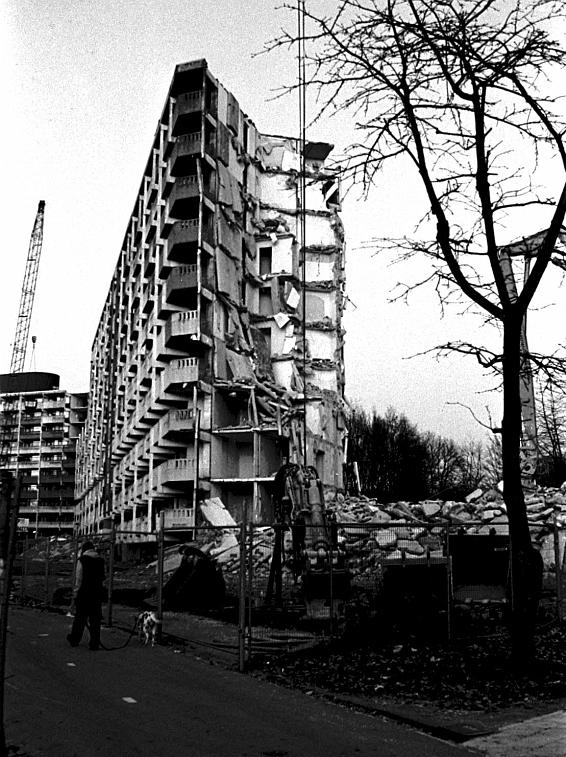 Inner city crackdowns on drug trade created a huge influx of dealers and junkies, for which the partially demolished tower blocks proved to be a suitable living and working environment. Enquiries demonstrate that local residents linked the growing crime rates to accelerating decay and dereliction, which reinforced their opinion that demolition was the only viable solution. However, the Bijlmer believers as well as most architects and planners remained strongly opposed to the renewal scheme that was implemented eventually. The latter condemned the scheme and its ‘middle-of-the-road’ architecture, which according to them was a bleak contrast to the highly idealistic CIAM-inspired original design. Soon after completion, the Bijlmer shared the same fate as so many other post-war housing schemes in the Western world: it had turned from utopia into dystopia. There are however some Dutch specificities, such as the government-initiated sprawl of suburban growth nuclei near large cities. 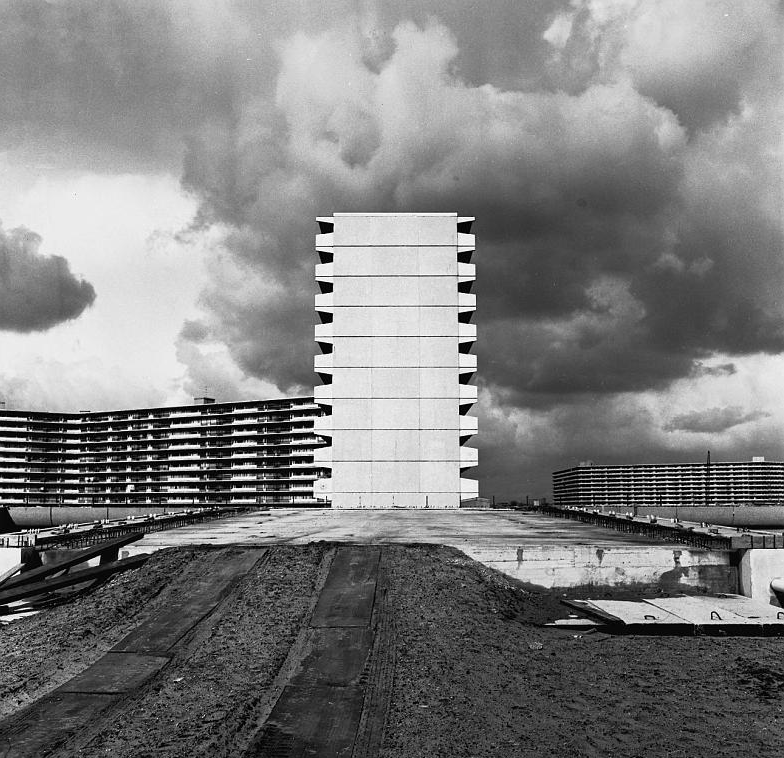 The differences and similarities between European countries in coping with social and planning issues in post-war housing estates has recently been addressed by ARCH+, as well as an all-encompassing dissertation by Dutch urban planner Frank Wassenberg. Now that the Bijlmer’s physical renewal scheme is nearing completion, policy makers are focusing on more central amenities and better public transport, for which the Bijlmer believers have been pleading ever since the first flats were completed. The estate’s bad reputation is changing for the better, but the question remains whether this is the result of the renewal scheme itself or the ever-increasing pressure on Amsterdam’s housing market. In the end, the imaging of the Bijlmer as a problematic monoculture was so strong, that further developments on the basis of the characteristic layout and architectural typology of the original plan was no option. Both professionals and policy makers thought reputation issues could be solved by changing the urban fabric. The still ongoing revitalization and regeneration of the Bijlmer is the final consequence of this linkage. A combination of high rents, technical deficiencies, lack of central amenities and a rapid growth in inner city as well as suburban housing alternatives led to a thorough discreditization of the Bijlmer estate. The first problem was soon dealt with by providing less-affluent residents rent subsidies, but the other issues proved to be more difficult to address. As Lea Olsson and Jan Loerakker have already shown in their previous contribution, it is apparent that it is still more attractive for politicians and urban planners to realize drastic, physical changes, than enhancing existing qualities with modest but strategic and precise interventions. Obviously, the Bijlmer regeneration scheme strives to settle a bill with the past. It shows no patience with the estate’s characteristics, which are deemed outdated due to the current focus on the gentrified city and re-evaluation of an urban way of life. This is understandable in the light of current developments, but as this contribution has shown there was much more at stake than design flaws when it came to determining the Bijlmer’s future.